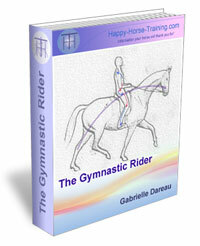 This diagram shows you how to check your horse is correctly balanced in lateral work, and, therefore, that this work is of gymnastic value. "Yielding the outside rein is an excellent test of the quality of bending the rider is achieving with a horse, because it tests whether the energy from each hindleg is being successful channeled through each side of the horse's body, via the postural support of the bend. What often happens when the rider gives the outside rein during bending is that the horse starts to drift laterally, either inwards or outwards, off the desired trajectory of the bend. Which way the drifting takes place usually depends on horse/rider crookedness, but in any case the corrections must come from the rider's leg aiding and weight via postural control. 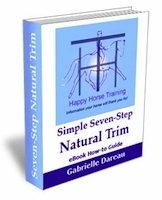 If the horse drifts in when the outside rein is yielded then more inside leg is needed and, most probably, more weight down the inside of the rider's body to maintain the seat's position absolutely central above the horse's spine. If the horse drifts the outside, then more outside leg is needed to contain the haunches and ribcage - a horse will never fall out 'through the shoulder' without one of these two being misaligned. A rider who has been used to containing the shear forces in the horse's movement [explained earlier in the chapter] with the outside rein, may find it very challenging to direct the horse without it, but this is because it takes time to build up the strength and straightness required in the horse for correct bending. 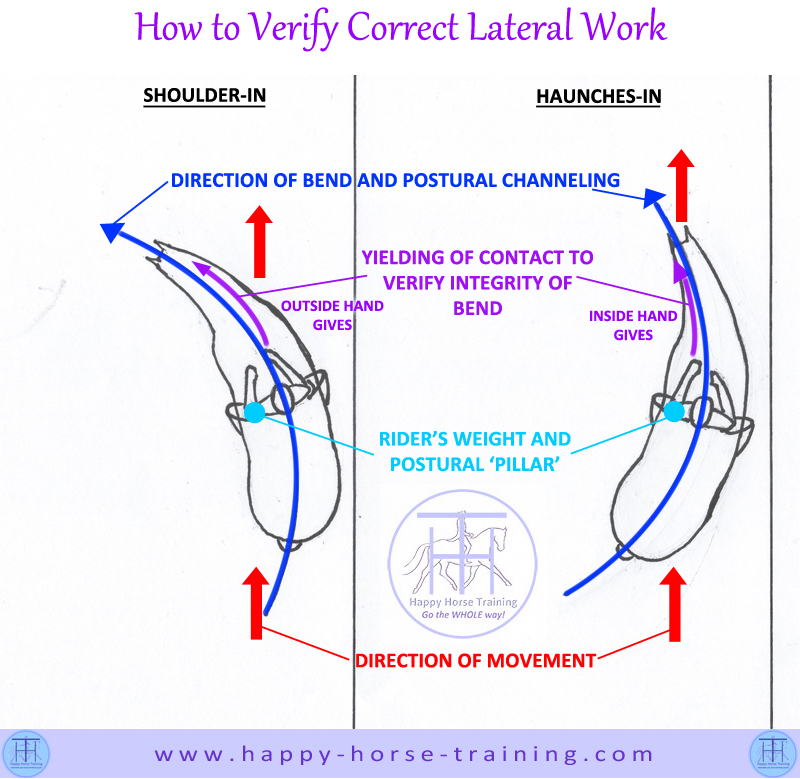 Lateral work is perhaps the most challenging situation for yielding the outside rein. In all shoulder-in type work, it is very common for the rider to contain and control the sideways movement with the outside rein. When the outside rein is yielded in shoulder-in for example, the rider may well find that either the horse's shoulders stay stuck to the track and only the neck bends, or that the horse turns right off the track instead of moving sideways along it. In both cases, the real correction has nothing to do with the outside rein, and everything to do with the rider's control of the horse's body with the posture, weight and leg aiding. The verification of a truly correct shoulder in is that the rider can completely give away the outside rein without any loss of control over the horse's bend, angle or trajectory. The exception to this rule (or, rather, a permutation of it) is that in all work based on haunches-in (e.g. haunches-in, half-pass, pirouettes) the correct bend is actually verified by the rider's ability to yield the INSIDE rein without loss of control of the bend and direction. This is because in haunches-in work, the direction of the shear forces has been reversed by the inward positioning of the haunches, and the fact that the horse is traveling towards the inside of the bend, not away from it, so the sheer forces are now directed towards the inside shoulder not the outside one. The rider therefore verifies successful channeling of the transmission straight through the horse's body (following the alignment of the bend) by being able to give the inside rein, which would naturally be used to contain shear forces that hadn't been addressed. In this kind of work, the outside rein contact remains steadily and softly connected, but without holding. 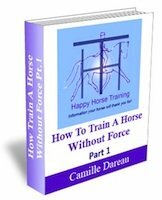 If, when either the outside or inside rein is released, resistance comes into the other rein where the contact is maintained, this is also a sign of insufficient postural channeling of the energy generated by the haunches. The rider must learn to feel where this energy is being dissipated, and address it with seat, leg and posture, so that the energy is transmitted through the horse's spine, creating the characteristic softening into the contact of engagement. We should always remember that the real purpose and value of lateral work is to strengthen postural channeling towards straightness and alignment, and increase the suppleness of the joints that feeds it."